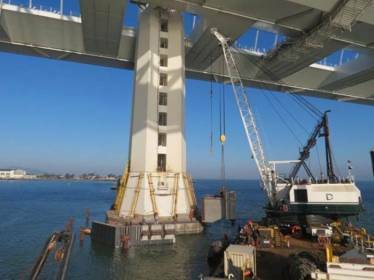 In February and March of 2012, Portland Bolt shipped almost four thousand 1” diameter custom F593 stainless steel hex head bolts and coupling nuts to be used in the fender system at the base of the new Bay Bridge that connects San Francisco and Oakland. 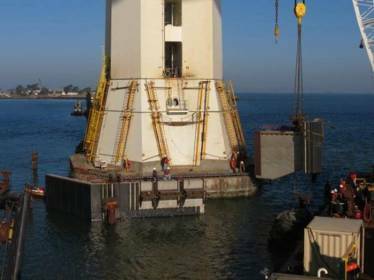 A headed anchor bolt would be poured into the concrete at the base of the bridge with a coupling nut assembled, and after the concrete set, a plastic lumber whaler was installed with a similar stainless steel hex bolt. Portland Bolt worked with the contractor to achieve the desired function of the assembly while keeping costs under control and meeting the project’s timeline for a complex installation. Portland Bolt was also responsible for supplying over three thousand ½” diameter domestic stainless steel lag screws used to attach a polyethylene panel to the outside of the plastic lumber whaler. All materials were supplied with 100% domestic material with full mill test reports and certifications.